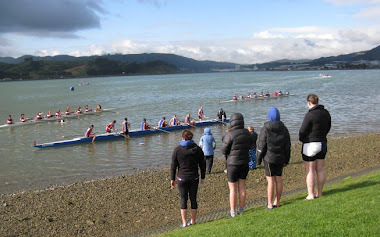 Porirua Rowing Club: Goodwill Regatta Rocks! Five clubs, dozens of rowers, 37 races, sunshine and good water - priceless! Thanks to everyone who turned out for this year's PRC Goodwill Regatta. Definitely a case of the more the merrier. The club had a chance to try its new boats on the water and put the new committee through their paces. For a change the weather played fair and we managed to run through the whole programme as scheduled.